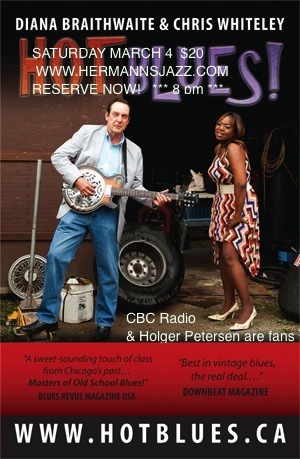 Multi-award winners blues duo singer Diana Braithwaite and guitarist/trumpeter Chris Whiteley from Toronto bring their band to rock the stage Saturday March 4 at Hermann's. Their new CD Blues Country is a treasure trove of new songs in an authentic blues style. Plus hear toe-tapping classics. Tickets $20. Doors at 6 show at 8 pm. the last two shows sold out so reserve your seats now on-line at http://www.hermannsjazz.com.